This salad started out the same as the one I made yesterday, but it had a totally different taste. 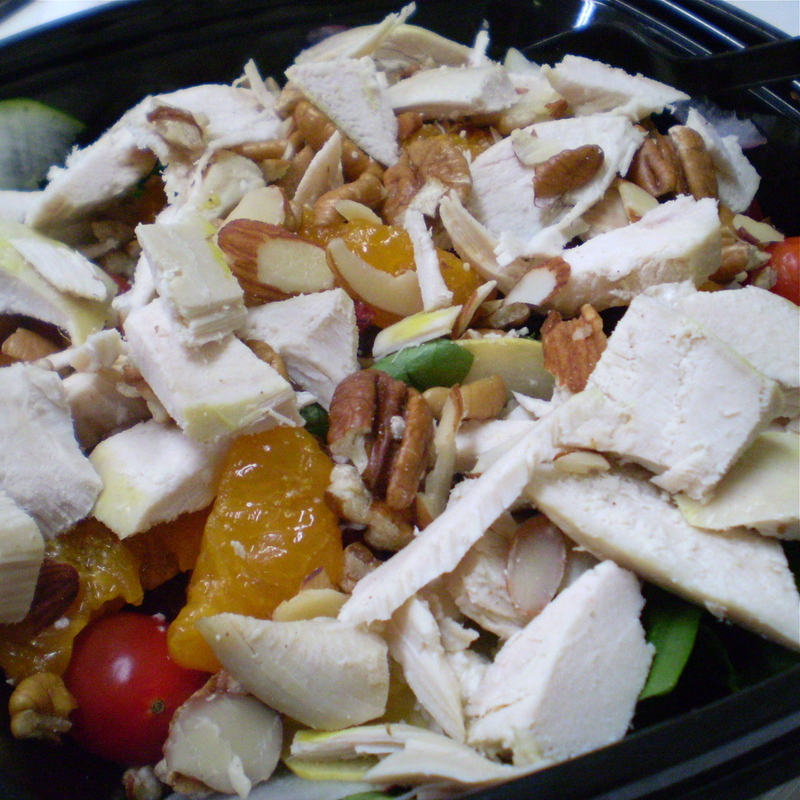 I added diced roast chicken, mandarin oranges, pecans and sliced almonds. I dressed it with store-bought honey mustard dressing. 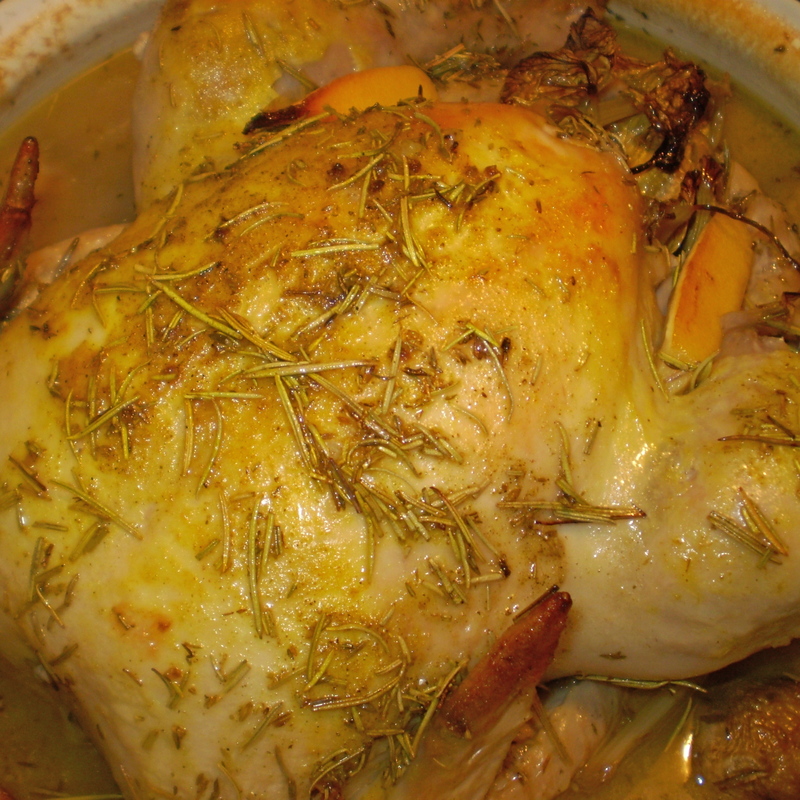 I roast a chicken every few weeks, usually when I see them on sale at the grocery store. I get at least one fresh meal out of it and then I have leftovers of the main meal, chicken for salads or sandwiches, chicken broth, and I set aside all the unappetizing “chicken parts” for the dogs. They love it when I add those “parts” to their bowls. Roasting a chicken is easy. Just wash it inside and out and put it in a roasting pan. I season mine with a variety of herbs. Tarragon has a distinctive flavor, at least to me, so I don’t usually mix it with other flavors. I have a personal herb blend I use on almost everything especially on chicken. I’ll pour about a half-inch of white wine in the bottom of the pan. Sometimes I’ll add mushrooms, celery tops, onions and garlic. It goes, uncovered, in an oven preheated to 400° for about 10–15 minutes. When the skin is crispy and golden I’ll put a lid on the pan, or cover it with foil and leave it for another 45 minutes or so. 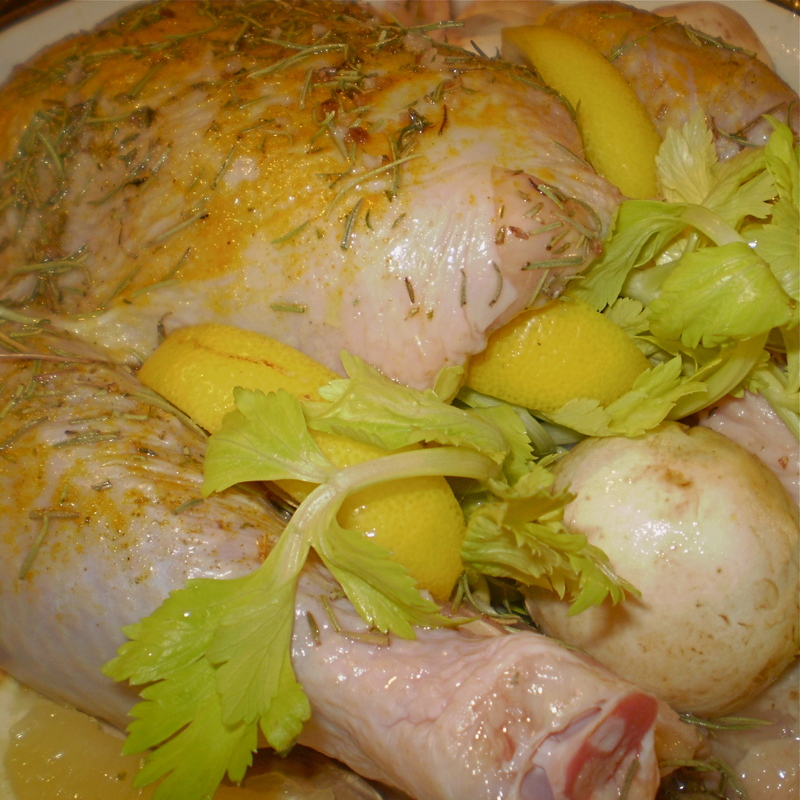 Fresh chicken seasoned with rosemary, tumeric, stuffed with mushrooms, celery, and lemons. As soon as I get it in the oven, I’ll put rice in my rice steamer and turn it on. When the rice is done, the chicken usually is as well. When the chicken is done, I take it out of the oven and let it sit for a few minutes while I get everything together for serving. Then I’ll take the chicken out of the pan and put it on a plate for carving. My favorite fresh hot piece of chicken is the leg quarter so I’ll pull that of and add it to the rice. I may make a gravy out of the pan juices, but if not, I’ll simply spoon the pan juices over the rice and chicken. Garnish with some slivered almonds and chow down. After I eat, and the chicken is cool I’ll debone it and put the whole breasts and any other meat in a container for future use. I may toss the bones, but if I have time I’ll put the bones back in the roasting pan, add some more water and put them on the stove top and cook them down to make broth. After the bones cook an hour or so, remove from the heat and let it cool enough to handle. Remove the larger bones with tongs or a slotted spoon . (Don’t feed them to your dogs or cats. They can splinter and cause internal injuries when your pets eat them.) After you think you have all the bones out, pour the broth through a strainer and remove the smaller bones. You can also strain it though cheese cloth if you want to get the rest of the chunks that are floating around. When the broth is strained, pour it into a tall container. I frequently use a tall plastic to-go cup I’ve saved. Put it in the fridge and the chicken fat will form a layer and harden on the top making it very easy to remove before you use the broth. I took a few days off work last week, so I was out of practice when it came to getting my lunch together this morning, but it was worth it when it came time to eat. I’ll do better tomorrow. I listed all the ingredients below since it’s so deep you can’t see everything that’s there. 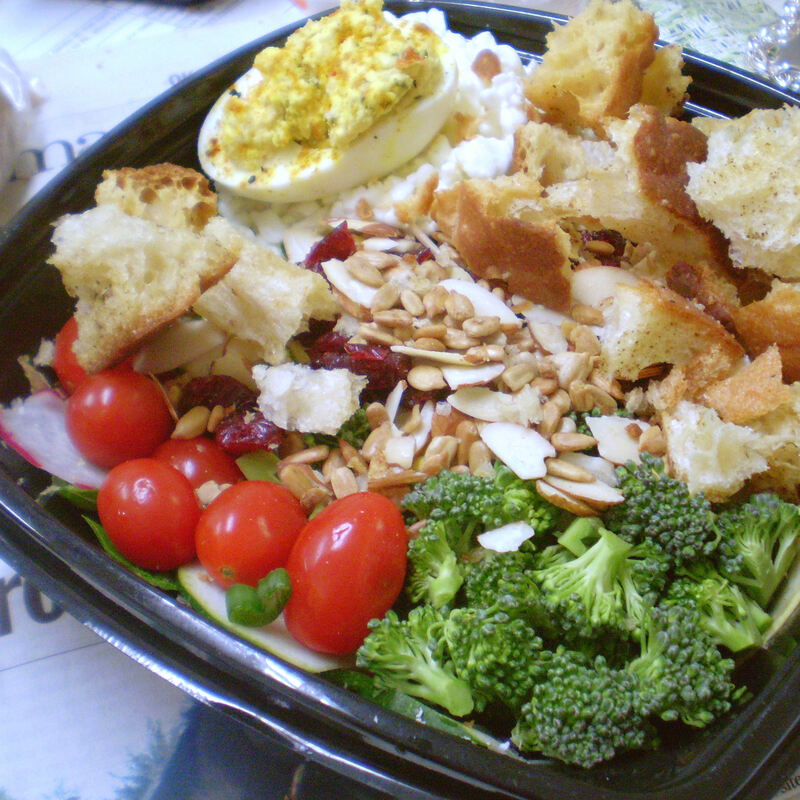 Eighteen ingredients plus a deviled egg made this tasty Monday salad. For me, salads taste better when there is a lot of color, a lot of texture, and a variety of flavors. I like something unexpected in amongst the greens, something that pops when I bite into it. There were two pops in this salad. Craisins, and grape tomatoes. I also prefer salads that aren’t a lot of trouble to eat. I want to be able to stab my fork into the pile and pull up a little of everything, which is why I make paper thin slices of carrot, radishes, zucchini, yellow squash and cucumbers. I don’t want to have to use a knife to cut my lettuce so I tear all the leafy greens into bite sized pieces. Broccoli or cauliflower gets cut or broken into small bites. I use grape tomatoes for several reasons. They don’t make the salad soggy like cut tomatoes do, and they are bite sized. Sometimes even cherry tomatoes can be a mouthful. The plastic bowl I used came from Target. They make a pretty good Salmon Mango salad with poppy seed dressing that I’ve enjoyed a few times. I put the lettuces, and sliced veggies in the bowl, usually piled separately instead of tossed to keep from crushing the lettuce. A small block of feta cheese goes in too. I break it up as I eat the salad. Craisins and nuts go in separate small lidded containers and are tossed on when I’m ready to eat. To make sure this lasts me all afternoon I make sure to add some protein. Today I piled on no-fat cottage cheese, and a deviled egg. Other, more filling options are well-drained tuna, salmon, baked or roast chicken, turkey, steak… and I’ll get into all that in another post. Tomorrow will be similar. I already have the lettuce in the bowl ready to go. I’ll try to remember mandarin oranges for tomorrow. I also have some baked chicken I want to add. If I go with the chicken and oranges I’ll probably use walnuts and almonds for garnish.